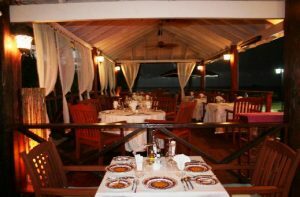 Welcome to La Bussola Restaurant, a warm and luxurious Italian restaurant located in the exquisite Runaway Bay of the underrated Antigua paradise. Located along the coast, diners can enjoy their meals with the perfect view while sitting on our shaded terrace. Whether you’re looking for that special place to host a cozy dinner for two or want to take the family out on a relaxing evening, our restaurant has just the perfect setting. We have the space to accommodate private parties and large groups. La Bussola is a family-owned and -run restaurant that caters attentive and friendly service combined with the ultimate taste of Italy experience. The menu is designed and overseen by executive chef Stefano Tagliaventi and pairs well with our exclusively selected wines from Italy, France, and Spain. Contact La Bussola today for a reservation.